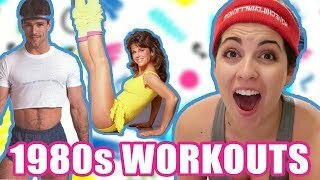 We all attempt to follow an 80's aerobic exercise music video! 50% OFF MERCH HERE: https://www.swipeupinc.com/collections/zane-hijazi Subscribe and turn on notifications! FOLLOW ME ON INSTAGRAM HERE - https://www.instagram.com/zane/ FOLLOW ME ON TWITTER HERE - https://twitter.com/zane FOLLOW ME ON SNAPCHAT - @ZaneHijazi BUSINESS EMAIL - zanehijazi46@gmail.com DOWNLOAD "BOOM" HERE: https://itunes.apple.com/us/album/boom-single/1436631441 Produced by: @BruceWiegner Friends in the video: Hidaya Hijazi - Instagram/Twitter/Snapchat: @HidayaHijazi Scotty Sire - Twitter/Snapchat: @imnotscottysire; Instagram: @vanilladingdong David Dobrik - Twitter/Instagram/Snapchat: @DavidDobrik Heath Hussar - Twitter/Instagram/Snapchat: @HeathHussar Matt King - Twitter/Instagram/Snapchat: @MattRKing Carly Incontro - Twitter/Instagram: @CarlyIncontro; Snapchat: @pooopflinger Erin Gilfoy - Twitter/Instagram: @eringilfoy; Snapchat: @erin_gilfoy Toddy Smith - Twitter/Instagram: @todderic_; Snapchat: @toddysmithy Jeff Wittek - Twitter: @jeffwittek Instagram: @jeff Jason Nash - Twitter/Instagram: @JasonNash; Snapchat: @Jason23Nash Liza Koshy - Twitter: @lizakoshy; Instagram: @lizakoshy; Snapchat: @lizakoshysnaps Mike Sheffer - Instagram: @MikeSheffer Alex Ernst - Twitter/Snapchat: @AlexErnst; Instagram: @Ernst Bruce Wiegner - Instagram/Twitter: @BruceWiegner Mariah Amato - Instagram: @MariahAmato Corinna Kopf - Twitter/Instagram: @CorinnaKopf Joe Vulpis - Twitter/Instagram/Snapchat: @UghItsJoe Jonah - Instagram/Twitter/Snapchat: @NickAntonyan Kristen Mcatee - Twitter/Instagram/Snapchat: @KristenMcatee Stas - Instagram: @StassieBaby Olivia O'brien: @OliviaObrien Dom DeAngelis - Twitter: @DomTheB0mb; Instagram: @weeknds; Snapchat: @DommyDeAngelis Get a free Uber/Lyft ride on me! - Uber code: uberzane46 / Lyft code: ZANE747554 if you see this good for u! Video uploaded by : Mia A.